The aftermath of Joyce’s death really has cast a dark shadow over this season which on one hand is understandable as the death of a parent is certainly a major life event, but here it seems to be used as a crutch to prop up the plot of this episode which itself is more about its final quarter than anything else. Perhaps this does sound alittle harsh seeing how here we get to see Buffy’s character being forced to grow and step up to her new responsibilities not only as her sisters protector but now her guardian aswell. Opening to Buffy quitting college here we essentially see her college days drawn to a close and Buffy set for the most part into the real world. One of the first challenges we see her having to deal with is that of how to be a parent which even Giles can hardly provide her guidence for her, despite himself being the closest that Buffy has to a father figure. Despite this he openly states that he can’t be a surrogate father to Buffy and Dawn knowing that only Buffy can forfill this role. At the same time considering that this originally setup to be the final season for the show, its weird that the focus would be so fiercly dedicated to her stuggles to adapt to essentially the “Mother” role. As such its almost as if the writers didn’t feel that the sisterly bond would be seen as strong enough for the season end game, but for now lets not get too far ahead of ourselves. The other big plotline here is the fallout between Willow and Tara who have their first major fight over Willows increasing power especially how she’s not sure she can handle such power which inturn turns into a real powder keg for the other issues which have been bubbling below the surface of their seemingly perfect relationship including most interestingly Tara’s fear that their relationship is just a phase for Willow and that she will go back to dating men. Honestly this fight felt like a long time coming, especially when you consider how drowned in smaltz their relationship with Tara being pushed rather unfairly it could be argued to the background of the show. This fight though really serves to setup Glory brain draining Tara who she mistakenly once more believes to be “The Key” as Willow attempts in vain to track her down only to arrive moments too late. While Glory continues to be a fantastic presence in the series, this week introduced taking a bath while her blindfolded minions continue to wait upon her. The scene though with Tara is really when she comes into her own, teasing out what we as the audience all know is coming the same way that a cat might play with a mouse and it really only makes it all the more heartbreaking when it does happen. 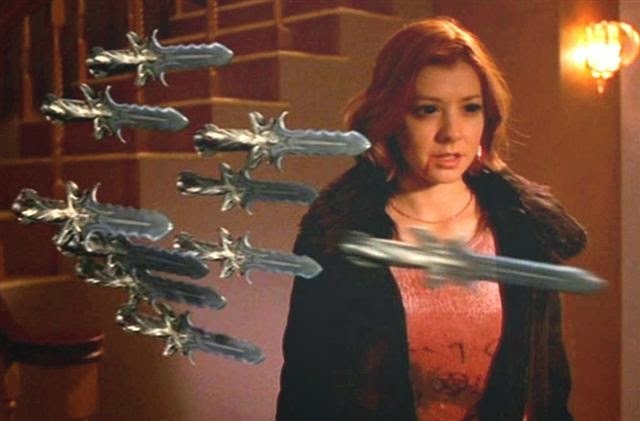 The finale of the episode has a revenge seeking Willow battling Glory as she unleashes her full magic, giving us a hint of “Dark Willow” as her eyes go black and even unleashes a bag of flying knives to little effect. You equally have to question how powerful a witch Willow is when she can be taken out by a damn chair. Stil Buffy is on hand to rescue her in a fight which does however show the Slayer adapting to fighting Glory as she comes off better here than any of their previous encounters. By the end of the episode it seems that its not just Buffy who has had to step into the parental role as each member of the Scoobies can in one way or another be seen as playing this role with Giles playing father figure for Buffy, Buffy as the parental guardian for Dawn, Xander and his continual attempt to keep Anya on the right track as she continues to try and make sense of the world around her with childlike wonder and finally Willow let caring for Tara as we close on her feeding her apple sauce. This would have no doubt made for a touching ending but the showrunners instead opt for the more impactful ending of Glory tearing the side off Buffy’s house before finally realising who the Key is!